NEW YORK (AP) It was a bull’s-eye for Kent Bazemore. 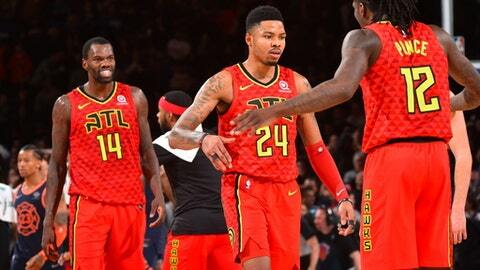 Bazemore hit a 3-pointer with 6.7 seconds left that put the Atlanta Hawks ahead Sunday in a 99-96 win over the New York Knicks. ”I read a book called the `Zen in the Art of Archery.’ It talks about just let it go. Let it go and let the energy of the world take care of the rest,” he said. Porzingis scored 22 for the Knicks. Trey Burke added 14, Jarrett Jack and Kyle O’Quinn each scored 11, and Enes Kanter finished with 10 points and 12 rebounds. Muscala hit a 3-pointer with 46 seconds left to pull the Hawks within one. O’Quinn missed a shot on the Knicks’ next possession and Bazemore followed with his go-ahead basket. Hawks: Atlanta has nine players on the 17-man roster with one year or less of NBA experience. Only Marco Belinelli (10), Ersan Ilyasova (9) and Luke Babbitt (7) have played more than five years in the league. Knicks: New York was attempting to win its 100th home game in its all-time series vs. the Hawks. They are now 99-68 at home, but trail the all-time series 195-175. … Porzingis has recorded a block in a career-high 22 straight games, which is the longest current streak in the NBA. Bazemore was awarded three free throws with 2:49 left in game. When he missed the second one, the Knicks rebounded and play continued. Hardaway got a dunk and was fouled, but the refs realized they hadn’t given Bazemore his third shot. The officials went back in time, nullified the basket and gave Bazemore another free throw, which he made. The Knicks subsequently scored on their next possession. Despite the loss, the Knicks have fared well playing on Super Bowl Sunday, having won eight of their last 12 and going 11-7 overall on the NFL’s biggest day. The Hawks did not commit a personal foul in the first quarter, though they still trailed 22-21 after the first 12 minutes. Malcolm Delaney was the first Atlanta player to be called for a foul. That happened with 8:43 left in the second quarter. Only two players on each team have played in every game this season. Courtney Lee and Doug McDermott have seen action in all 54 games for the Knicks, while only Bazemore and Prince have played in all 53 for the Hawks. Hawks: Visit Memphis on Tuesday.